I'm not very imaginative with names so I simply named this bear "Lilac". She was given to me by my mum some time ago along with this very posh chair. I can't remember if it was a special occasion or not but it certainly was a very special present to me. I love to collect bears but I mainly have brown ones, I don't usually like other colour bears as they don't look very natural to me. However "lilac" is just so adorable, her color is so delicate that it doesn't look false or childlike, which some coloured bears can. She has jointed legs and feels very well made, her label simply says "heart felt Collectibles". If anyone knows of this company I would love to know more about them. She will always have a special place in my bear hug as I associate her with my mum. 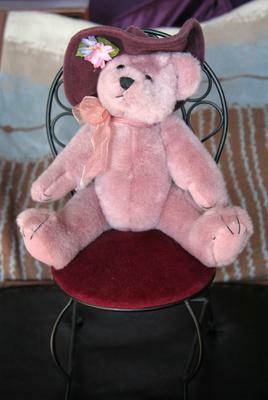 She certainly stands out amongst all my other bears as she sits on her chair. She looks like a lady, don't you think in her lovely big hat. Certainly a bear who knows what she wants and expects to get it, tee hee. Anyway that's "Lilac" bear, I hope you like her. Join in and write your own page! It's easy to do. How? Simply click here to return to Pink Teddy Bear Pictures.